I have always liked to build things and figure out how stuff works. 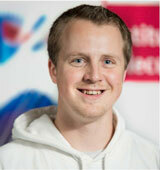 Therefore, solar cell research fits me perfectly! In 1 day in the lab, I first have to make a solar cell and then I have to understand why it works. And best of all, these solar cells can be made so quickly that in the evening I still have time to play tennis or just meet my friends! Making discoveries is my biggest thrill. Finding out how nature works and using that to make something new that works can make me smile. I like to learn how simple molecules can be used to turn sunlight in to electricity. The best next thing to science is making a long walk in the mountains and enjoy the fresh air, the sun, and the view. Located in the heart of San Francisco, French American International School is an independent PreK-12th grade international school of 1,080 students. In the lower and middle school, we offer a bilingual immersion program that culminates in our International High School, where students complete either the French or International Baccalaureate program. Regardless of school section or program, the sciences have always featured prominently. In recent years, our curricula have been enhanced by the launch of an upper school Science Club, and by the opening of a lower school Tinker Space and upper school Design Lab. Students and teachers use these spaces to further interdisciplinary investigation at the cross-section of scientific and design thinking www.frenchamericansf.org. Solar cells use freely available sunlight to make electricity. At the present time, solar electricity does not come cheap, because solar panels are rather expensive. Now imagine that we could reduce costs by printing solar panels like we print newspapers! We can do just that with plastic solar cells. In this article, we explain the basic working principles of these novel plastic solar cells and then show how a stunning threefold increase in solar energy efficiency can be achieved by including a special additive to the printing ink. The function of such a special additive seems almost magical, but as scientists we know that true magic is really rare and we simply had to find out why and how it works. That was the subject of our recent investigations and in this article we describe how we divulged the secret of the special additive. While you are reading this article, your computer is using electricity. Where does this electricity come from? In 2013, around 67% of the electricity used in the U.S. was generated by burning coal or natural gas . What if the supply of coal and natural gas runs out? And what about the pollution and climate change caused by burning gas and coal? There is a much friendlier source of energy: the sun! Best of all, it is free! The sun always shines and provides energy to the earth in the form of light, even on cloudy days. Solar panels convert this light into electricity, but solar panels are still pretty expensive. If solar panels were less expensive, we could use the sun to its full potential and have very cheap electricity! Scientists recently found a new way to make solar panels: by printing them! Most people think about printing things like books, but we can also use a special kind of printers to print objects made out of plastics. Plastics are made of polymers, which are very long molecules. Under a very strong microscope, polymers look like cooked spaghetti, but, in fact, they are a million times smaller. To print plastics, you simply replace the ink cartridge in your printer at home with “plastic ink.” The plastic ink is a combination of two polymers dissolved in a liquid. When printed, the liquid dries and the two polymers form a thin film. 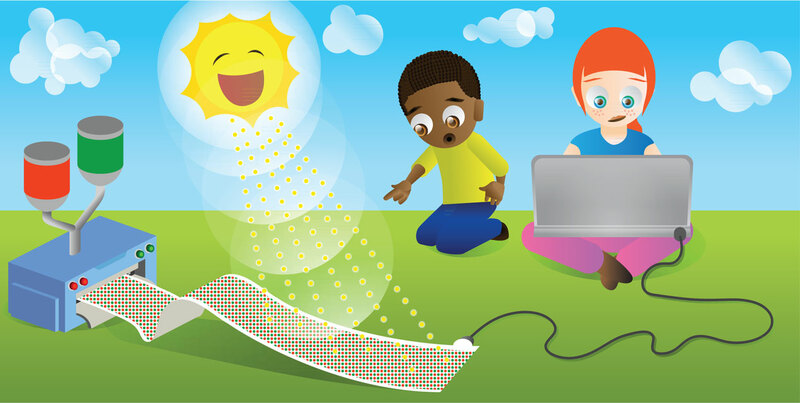 For solar cells, we use a special type of polymer that can convert sunlight into electricity. Plastic solar cells can be printed on large rolls of flexible foil. Recently, 100 m-long solar panels were printed . Using these cheap solar panels, only around 1.5% of the energy in the sunlight is converted to electricity. This efficiency is still low compared to the expensive solar panels you can buy now, which can convert 15–20% of the sun’s energy into electricity. But the future looks bright. In laboratories around the world, small plastic solar cells are already being made with much higher efficiencies, up to about 12% . One of the tricks to increase the efficiency is adding a special additive to the plastic ink before printing. This special additive was found by accident , but if we want to improve the efficiency of the plastic solar panels even further, we need to know why this special additive works. Understanding how plastic solar cells work is not easy. Many scientists have worked on this topic for years. As background, we explain the most important findings in the next two paragraphs, but if you feel that you are more eager to learn about the secrets of the special additive you can skip these paragraphs and read about our investigations and our results further on. How do Plastic Solar Cells Change Light into Electricity? To answer this important question, we have to look how plastic solar cells are made. Plastic solar cells consist of a plastic layer on glass or a flexible foil. In the lab, we use glass plates with a transparent electric contact [the positive (+) pole]. On top of this contact, we put the ink for the active layer, which is the part of the solar cell that converts sunlight to electricity. This ink contains two polymers, a long green one and a shorter red one. 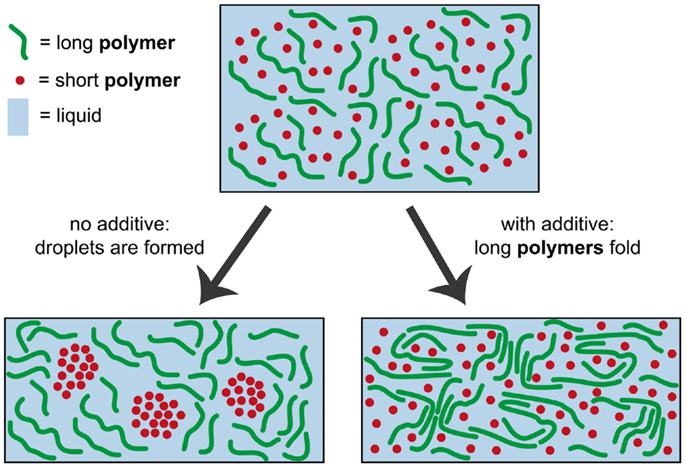 The polymers form a mixed layer, as shown in Figure 1. On top of that layer, we put a metal layer, which functions as the negative (−) pole. We then turn the whole stack of layers upside down such that sunlight can shine through the glass into the active layer. Figure 1 - Diagram of a plastic solar cell. Sunlight creates a plus (+) and a minus (−) charge at the interface between two polymers. The (−) charge moves to the (−) pole of the solar cell and the (+) charge to the (+) pole. These poles work just like those in a battery, but are powered by the sun and never run out as long as the sun shines. The drawn structure of red and green polymers in Figure 1 is exactly what we want! There is a lot of interface, or area of contact, between the two polymers. This is necessary, because sunlight creates electrical charges only at the areas where the two polymers are in contact. When the light is absorbed (the yellow star), positive (+) and negative (−) electrical charges are generated. Normally, the + and − attract each other and the energy is lost. In plastic solar cells, the red and green polymers make sure the charges can be separated. The positive and negative charges then move to the + and − poles. Now, light is converted to moving charges, which is electricity! Think about how useful this is – we use free sunlight and two cheap plastics to make electrical energy! Can we See These Small Polymers? The green and red polymers are so small that we cannot see them easily, even when using a normal microscope. But we can see them with an electron microscope, which does not use light, but electrons to “look” at the solar cells. 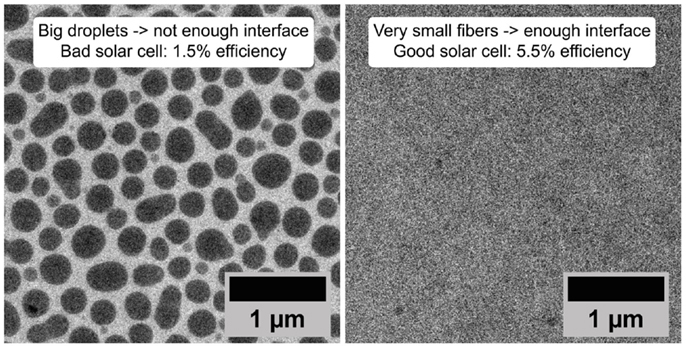 In Figure 2, we show electron microscopic images of real plastic solar cells. These are images looking down on the active layer. The two polymers show up as dark and bright areas and not as red and green because electrons are “colorblind.” On the left, a poorly working plastic solar cell is shown. The large droplets create very little interface and the efficiency is low: 1.5%. On the right, a much better plastic solar cell is shown. The structure between dark and bright areas is now so small that it is actually hard to see, but it means that there is a lot of interface. This allows for more charges to be made and triples the efficiency to over 5%. These solar cells are still not the best, but they can help us to understand how plastic solar cells work. Figure 2 - Top view microscopic image of a bad solar cell (left) and a good solar cell (right), taken with an electron microscope. Remember that we are looking at very small things: the length of the scale bar is one millionth of a meter (about 3 millionth of a foot). The scale bar would fit 100× in the width of a human hair! The big droplets in the image on the left have little interface between the two polymers, which is bad for solar cell efficiency. The image on the right has very small fibers, which create a large interface between the two polymers, which is good for solar cell efficiency. How did we go from the bad solar cell in the left image to a good solar cell in the right image of Figure 2? The “magic” trick is to use a special additive while making the active layer. The additive is a slowly drying liquid, which is added to the ink in a small amount. This smart trick was first shown in 2007 , but nobody understood exactly how it works. Let us first have a look what it does and then try to see if we can understand why. The active layers are made by a process called spin coating the ink, as shown in Figure 3. Spin coating is a technique to make thin films from an ink. The regular spin coating process is shown on the top row of Figure 3. A drop of ink that contains the green and red polymers in a liquid is put on a glass plate. By very fast rotation, a thin wet film forms that dries within 1 s by evaporating the liquid. While drying, the red polymer forms large droplets, which cause the poor performance. The bottom row shows the same spin coating process after the additive is added to the ink. Now, drying takes longer, about 5 s. As you see, no droplets are formed when using the special additive. 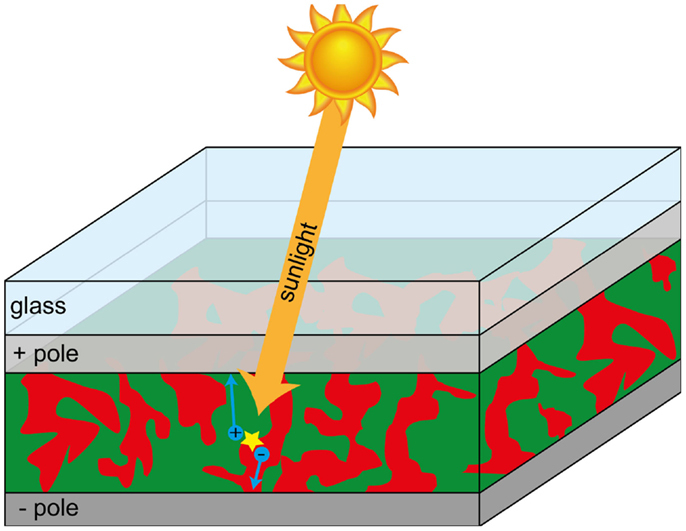 Figure 3 - Plastic solar cells are made by spin coating. Spin coating is a technique to make thin films. Here, a side view of this process is shown. The top view looks like a pottery kick wheel. First (on the left), a droplet of ink (either with or without the additive) is put on a glass plate. Then (middle), that glass plate is rotated at high speed. Because of the rotation the ink droplet spreads out and forms a thin film. Without additive, the ink is dry within 1 s and the red polymer clusters in droplets (top right), which is bad for solar cell performance. With additive, the drying takes longer and the red polymer is more spread out (bottom right), which is good for solar cell performance. To untangle the mystery of the role of the special additive in creating a good solar cell, we set out to study in detail how the active layer dries. To study this drying process during the spin coating process, we had to build a new experimental setup. In this setup, we shine a laser on the spinning glass plate. The reflection of the laser changes when the droplets are formed. In this way, we found that without additive the large droplets form in a late stage of the drying process, and even later, the green polymer changes color! To understand what happens when the color changes, we recall that the green component is a long polymer. We know that long polymers can fold up, similar to how a snake curls up. The folding makes the green polymers change their color to dark green. Using our special setup, we determined the time at which the color changes and the folding happens. We discovered that the effect of the special additive is to make the green polymer fold earlier than it does without the additive, and even before the droplets would normally form! The reason is that the additive and the green polymer do not like each other very much. As a result, the green polymer folds up when it “feels” the additive. Surprisingly, we saw that once the green polymer folds, the red polymer does not form droplets. The folding of the green polymer holds back droplet formation and results in better mixed layers. The mystery is solved! A diagram of the new insights is shown in Figure 4. Figure 4 - Diagram of how the special additive works. The top figure shows a small part of the ink droplet we put on the spin coater. We see that the green polymers and the red polymers are mixed. During the spin coating, the ink will dry. Without additive, we see a clustering of the red polymers. With additive, we see something very different: the green polymers fold up. The folding prevents the formation of the clusters of the red polymers. Plastic solar cells have a huge potential because they can be printed cheaply on large flexible foils. Their efficiency still needs improvement, but can be improved threefold by adding a special additive to the printer ink. Since this additive is very useful, we wanted to understand how it works. With a new experimental setup designed to study the drying of the ink, we found that the special additive controls folding of one of the two polymers. The folding prevents large droplets and increases the amount of interface between the two polymers in the active layer. The interface is very important the efficient conversion of sunlight into electricity. In the past, solar cells were optimized by lots of hard lab work and you had to be lucky to make a good cell. Now, because we understand the process of the drying, we can think of even more clever tricks to optimize these solar cells! In the future, this will hopefully lead to cheap and efficient electricity production from printed solar panels! 1. What is the advantage of plastic solar cells compared to existing solar cells? 2. What is the main problem with plastic solar cells? 3. 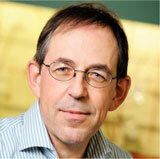 Why is the additive a smart idea? 4. How does this research make solar cells more accessible in the future? Active layer: ↑ the most important layer of plastic solar cells. This layer is where sunlight is converted into charge. Additive: ↑ An additive is a small chemical, which can be added to the ink, but does not remain in the solar cell after the ink dries. Electron microscope: ↑ A normal microscope uses light to see very small things. However, if things are too small to see with a normal microscope, we need to use an electron microscope. As the name implies, electrons are used instead of light. Ink: ↑ A combination of liquid and solid materials that can be printed or coated onto a surface. During printing or coating, the liquids evaporate and the solids remain on the surface. Interface: ↑ The boundary between two materials. Polymer: ↑ A long molecule that looks like cooked spaghetti, but is a million times smaller. Plastics contain polymers. Spin coating: ↑ A coating method to make very thin films. A droplet of ink is put on a glass slide, which is then rotated at high speed to spread the ink. After spreading, the ink dries and a very thin layer is left on the glass. Submitted: February 25, 2015; Accepted: May 2, 2015; Published online: June 29, 2015.